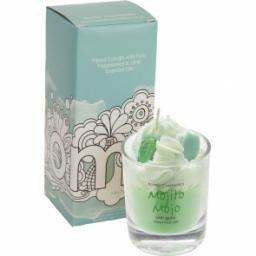 Mojito Mojo Whipped Candle in a glass. Refreshing notes of mint and lime create this classic cocktail, with a sprinkle of suagr to sweeten with peppermint and lime pure essential oils. Burn time of 30 to 35 hours.